The first step towards a beautiful, healthy, bright white smile is to schedule an appointment. 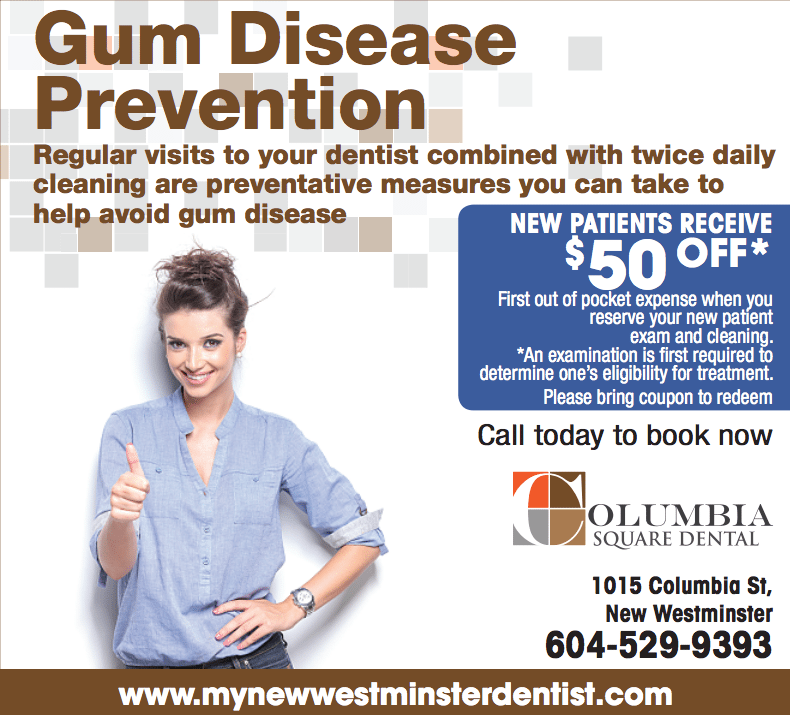 Call us today at (604) 529-9393 to schedule your check up and cleaning. April is Oral Health Month and we want to celebrate with you! Oral B Genius & Whitening Package is available now in our office for the reduced price of just $99.00. It’s a brush so advanced, it can help you brush just like your dentist recommends. • A pressure sensor that alerts you if you’re brushing too hard • A rounded brush head – inspired by dental tools • Position Detection technology – so you never miss a zone Call or visit our clinic if you’re interested! How Dentalcard Works? No down payment No collateral High approval Competitive interest rates No early payment penalty Applying for financing is as simple as filling out the online application. You can request financing for a portion or Dentalcard will finance the complete procedure. Most patient’s applications are quickly approved for funding – in fact, financing can be approved while you are at your dentist’s office! Dentalcard’s professional and experienced staff is committed to helping patients obtain financing for the dental treatments they want. Contact our office at 604-529-9393 if you have any questions or if we can be of assistance. Please note: This offer is no longer available. Taking care of your teeth is important for overall health and quality of life at any age. Brush daily (especially at bedtime) and don’t forget to floss! We can help too, call us during the month of September to reserve your new patient exam and cleaning and recover $50 off your out of pocket expense. Browse our website to learn more about us or call 604-529-9393. Columbia Square Dental has won the 2016 Reader’s Choice Award for Best Cosmetic Dentistry in New Westminster! We are so proud that our patients appreciate us, as we make them our number one priority when they come to us for their dental care. We strive to make all who come to Columbia Square happy, and this award shows that we have made an impact on our patients. Thank you to everyone who voted for us! We look forward to providing you with great service in the future. 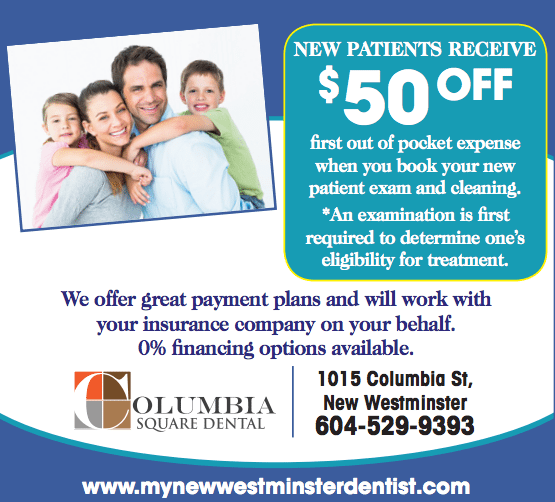 Please note: The new patient offer for $50 off is no longer available. Columbia Square Dental is accepting new patients! Families are welcome. Healthy teeth and gums are important for the overall health of your family. You care about your family, so help them care about their dental habits early and set them up for a lifetime of good dental health. Contact us today to book your next appointment and we will take $50.00 off everyone’s check up and cleaning. We want to give back to the community we thrive in! 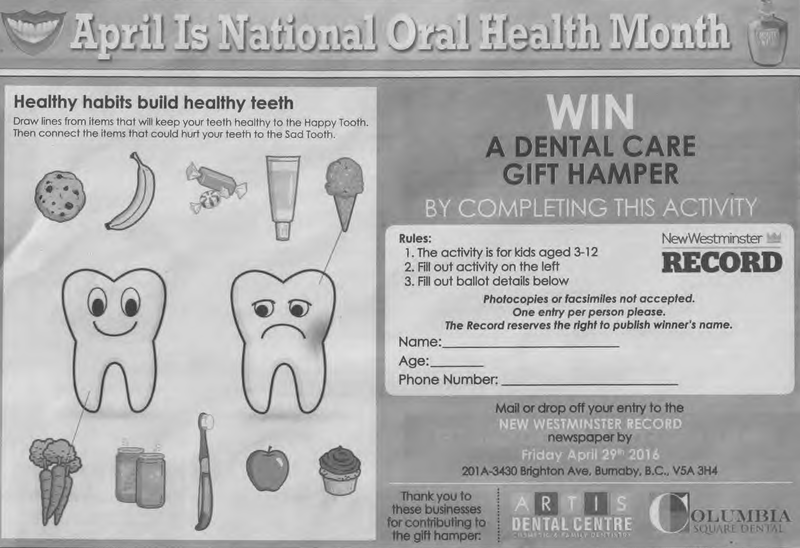 For National Oral Health Month, we are donating one adult Oral-B electric toothbrush and one kids Oral-B electric toothbrush to the New Westminster Record newspaper. On Thursday April 21, 2016, the New Westminster Record newspaper is doing a special edition which will feature an activity, the picture above, for you to complete as an entry to a draw. All entries can be dropped off or mailed to the New Westminster Record newspaper by Friday April 29th, 2016. Their address is 201A-3430 Brighton Ave, Burnaby, BC V5A 3H4. The winner will be getting a basket made up from the community, which will include our toothbrushes! Be sure to watch for it, you won’t want to miss out! Good Luck! Did you know that oral health is a window to your overall health? A healthy mouth serves as a “window” to the rest of the body, providing vital indicators of health disorders. Studies have linked oral bacteria and gum disease to a host of diseases and yet people tend to avoid going to the dentist even when their gums are bleeding. “People often ignore signs of Periodontal disease as it can be painless. Things like: bleeding gums when brushing, puffy swollen gums, bad breath that won’t go away are just a few signs. Seeing your hygienist regularly is very important for your health,” says Michelle Nguyen, a hygienist at Columbia Square Dental. “In dentistry a big issue is for the patients to realize how you live, eat, feel, and think determines your health. To prevent disease, you may have to change how you live. If you want to save money, regular visits with a hygienist are key. Regular cleanings and check ups save you from costly emergency visits.” Columbia Square Dental team of professionals – and its skilled hygienists – are helping patients avoid gum disease, or if they discover Periodontal disease, they can help. If you are or have been a smoker, you have a greater chance of developing oral cancer. At Columbia Square Dental they provide cancer screening. However, oral cancer isn’t just limited to smokers. When you get your teeth and gums checked, dental professionals look out for lesions that may be cancerous. Another reason why regular dental visits are crucial is because we are living longer than ever and your teeth need to last. Twenty-five years ago, it was common to see seniors with dentures. Nowadays, dentures are less common. 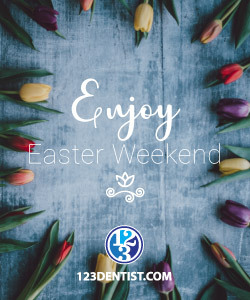 Besides offering the best and latest in dentistry, what makes this dental practice stand apart from the rest is their commitment to providing patients a warm, caring and friendly approach. At Columbia Square Dental you will experience a comfortable, soothing and unique clinic, specializing in customized care tailored specifically to your needs. Starting from the initial assessment, each dentist wants to ensure your experience in their office is an optimal one, and everyone looks forward to exceeding your expectations. Are You Throwing Away $1000, $2000, $3000 Dollars?